A few months ago, toward the end of November I think, I got the urge to call up my friend Josh. I was having kind of a crummy day and really wanted to hang out with him. He lives out in Naperville and couldn’t make the trip up to Chicago. Instead, he suggested that I should come out there and we could walk around the downtown area and maybe get a drink. I was all for it. Apparently, no one in Naperville drinks scotch. If my buddy is any indication, they down Goldschläger and Rumple Minze like its water. The bartender at first bar we went to literally did a double take when I asked for a scotch, neat (she almost asked me whats in it, no joke). What was handed to me was a really, really, really bad scotch. I won’t even mention its name for fear that anyone might go near it. I can’t stress enough how much I hated this scotch. Immediately after that experience we headed to another bar, hope we could at least have a decent drink that didn’t taste of rubbing alcohol. The second bartender was just as surprised at my order, noting that she had to open up a bottle because no one ever orders scotch (seriously Naperville!?) She ended up placing a double of Macallan 12 year-old (and only charged me for a single). I had never had Macallan before that moment and I was genuinely surprised at how decent it was. 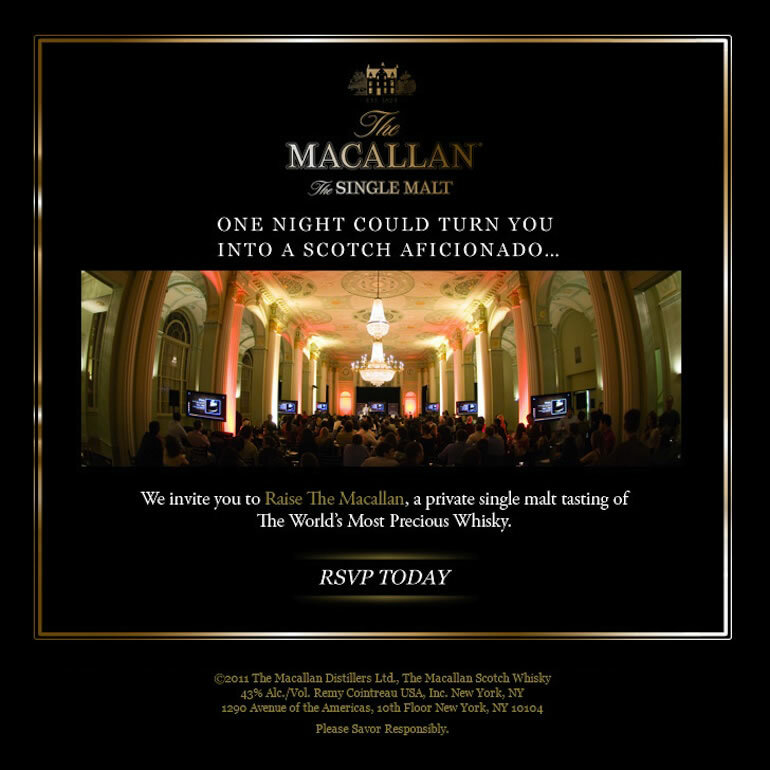 Macallan gets an undeserved bad wrap amongst scotch enthusiasts. Its not a showy scotch, but it is very drinkable and smells amazing. There are some scotches where the nose (scotch term for aroma) is often the real treat. Macallan live up to that type of whisky. If you would like to try this fine specimen of scotch, I have good news. There is another free (FREE!) scotch tasting next week. Preregistration slots are still open so act fast. Just click this handy dandy link and sign up! I will probably be there on the 20th at the 6:15-745pm show. 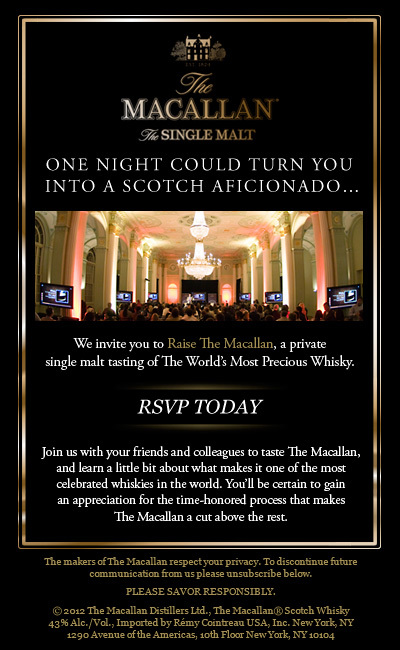 This will be my first Macallan tasting. Please note the awesome wording of the following advertisement for the tasting. It’s not “drink responsibly” but “savor responsibly”. I though that was cool. 12 Apr	This entry was published on April 12, 2012 at 6:48 pm. It’s filed under food and drink, nightlife, personal and tagged booze, free, night out, scotch, scotland, tasting. Bookmark the permalink. Follow any comments here with the RSS feed for this post. I have never been to a Scotch tasting, but have been to several whiskey tastings. They are a great way to meet bar owners and distributors if you enjoy networking. Have you thought about working for a scotch distributor? I have a friend that is currently making the move into beer distribution (at the corporate level) and it sounds like a great job for someone passionate about their brews. Those jobs are in high demand because of Chicago’s growing cocktail and beer culture. Just something to think about. I’ve dabbled in working for a marketing company that handles wine and liquor tastings. I would love to work for a scotch distributor. I’m very much into the whole cocktail and beer scene, too (which will be evident in a few posts from now).